Discussion in 'E3D-v6 and Lite6' started by Webdad, Nov 13, 2017. I've built a 300 x 300 x 300 D-Bot and I'm using an E3D V6 full with a Titan extruder. Build recently finished and I'm working on the tuning and calibration. 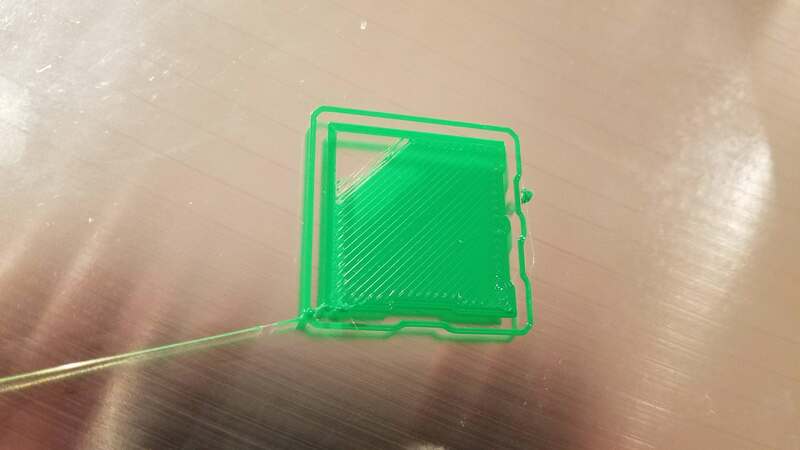 I've gone through calibrating extruder, X, Y, and Z steps, everything checks out as far as I can tell. The problem I had (but never resolved) with PLA was jamming in the heat break, so I switched to PETG. Results are marginally better - definitely get a better first layer, but the PETG also apparently jams after less than 10 min of printing and the Titan starts clicking. The most recent test was with PETG - print temp 250c, bed 70c. This first layer generally looks good until the filament stopped extruding and the Titan started clicking. 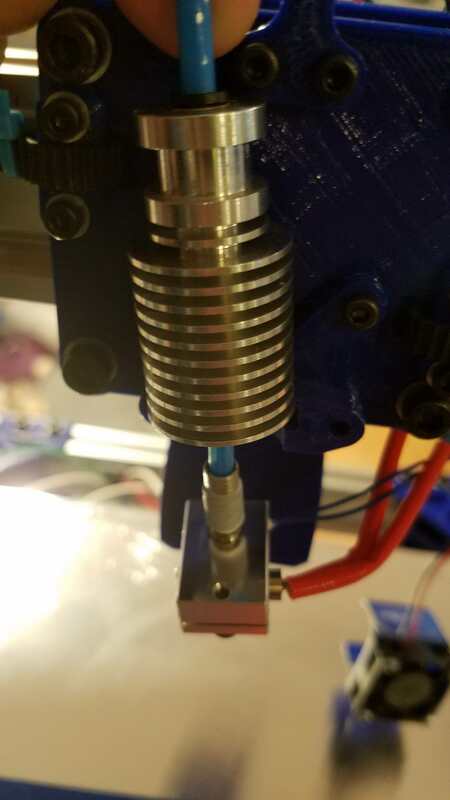 I suspect a lot of problems when filament is jammed are due to the difficulty and complexity when assembling the hot-end, heat-break and heat-sink and may be related to how the ptfe is cut, the correct length, straightened, not countersunk at the top and the inside diameter not checked for obstructions. Plus correct application of thermal compound and only on the heat-break where it screws into the heat-sink. 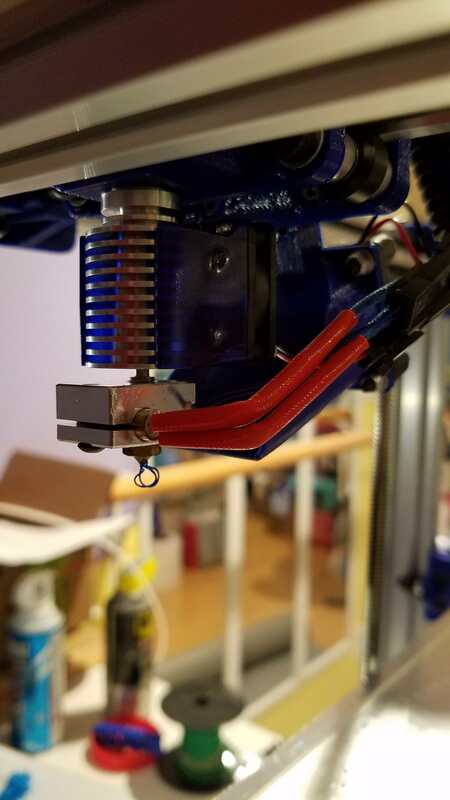 If you are getting jamming with two different filaments then the common factor is the assembly, or how you cool the heat-sink and always letting the fan run (usually automatically) until it gets down to 40oC when cooling down. I took particular care to cut the ptfe to the correct length and cut absolutely square and not crushed, countersunk at the top to receive the filament, then checked the ID (and straightness) with a drill bit. I found my ptfe tube as supplied bent in a radius of the storage spool, crushed at the end by cutting with side cutters (probably by me!) and had a lot of resistance when I tried (out of the heat-sink) to feed filament through manually. It is also possible to mount the blue fan shroud the wrong way up so decreasing the flow of air over the heat sink. I guess the new clip to sit under the little black bowden fitting in the top of the heat-sink is also a good investment. It is worth doing a search on Titan and "clicking" as there are lots of posts on this including some from early Titan shipments that had some out of spec hobbed wheels. @Hein du Plessis. Just to put your mind at rest, many people here print PETG on the E3D v6 including me. Never had a jam with PETG that I can recall. E3D's own Edge filament is a PETG derivative also.